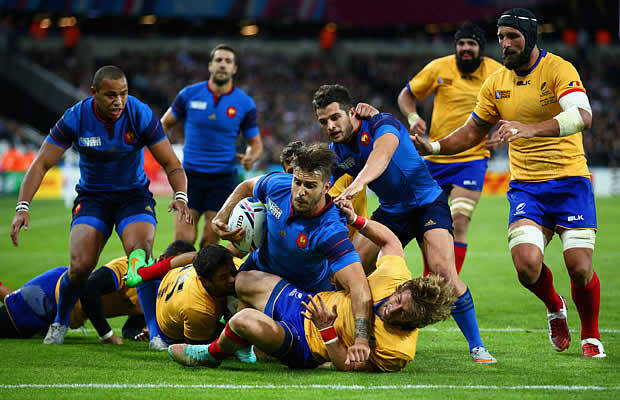 France powered to a 38-11 Bonus point Rugby World Cup victory over a gusty Romania side in Pool D match at London’s Olympic Stadium. France made 13 changes for this match and due to the changes they made a slow start but in the second half ran away with the result. The French scored five tries to seal a bonus point, with wing Guitoune and flanker Yannick Nyanga going over in quick succession in the first half. 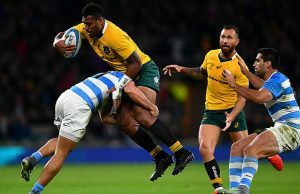 Guitoune and centre Wesley Fofana also crossed within minutes of each other late in the game before Gael Fickou went over two minutes from time. France coach Philippe Saint-Andre made 13 changes to the side that beat Italy 32-10 in their Pool opener at Twickenham on Saturday — when wing Yoann Huget’s World Cup was ended by injury — and it showed early on as Romania forced a series of turnovers after Morgan Parra kicked Les Bleus into an early lead. Romania thought they had the game’s first try in the 17th minute when, after winning a line-out near the French line, they drove forward and spun the ball to centre Florin Vlaicu. But, with replays inconclusive, South African referee Jaco Peyper — much criticised for excessive use of video replays during England’s opening win over Fiji last Friday — disallowed the score. However, Romania had won a penalty in front of the posts and Vlaicu kicked his side level. He then missed from 35 metres out and, worse still for Romania, tighthead prop Paulica Ion was sent to the sin-bin after deliberately collapsing a maul. France made the most of their man advantage in the 30th minute. Guitoune dived over near the right touchline, keeping his feet inside the whitewash, despite a last-ditch tackle by Catalin Fercu. Scrum-half Parra added the conversion to make it 10-3 and three minutes later France, three-time losing World Cup finalists, had another converted try. Full-back Brice Dulin, coming into the line with a neat side-step, initiated the move with a well-judged pass from Parra finding Alexandre Flanquart who in turn released Nyanga, with the flanker crossing the Romanian line out on the right. Parra kicked another excellent conversion before Vlaicu cut France’s half-time lead to 17-6 with his second penalty. More sloppy play marred France’s start to the second half and they failed to make the most of good field position when they kicked a penalty to touch for a line-out just metres from the Romanian line. 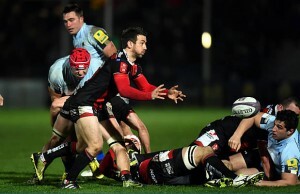 But they eventually had a third try in the 66th minute when Guitoune, stretching for the line, was eventually ruled to have scored despite suspicions of a double movement. Parra converted and the game was beyond Romania. The French then made sure of the bonus point when Dulin released Fofana, who grounded the ball despite some despairing last-ditch tackles, with Rory Kockott kicking the conversion. But the try Romania — coached by Welshman Lynn Howells — deserved for their efforts came when flanker Valentin Ursache went over from a close range line-out in the 73rd minute before France centre Fickou completed the try-scoring.